Kitchen pop-ups have gained steam and are becoming more frequent and popular in Los Angeles due to social media. It’s an ideal way for chefs to showcase their dishes and perfect their hospitality skills, without investing hundreds of thousands of dollars. If successful, Pop-ups attract a foodie following and investors looking to open a restaurant. 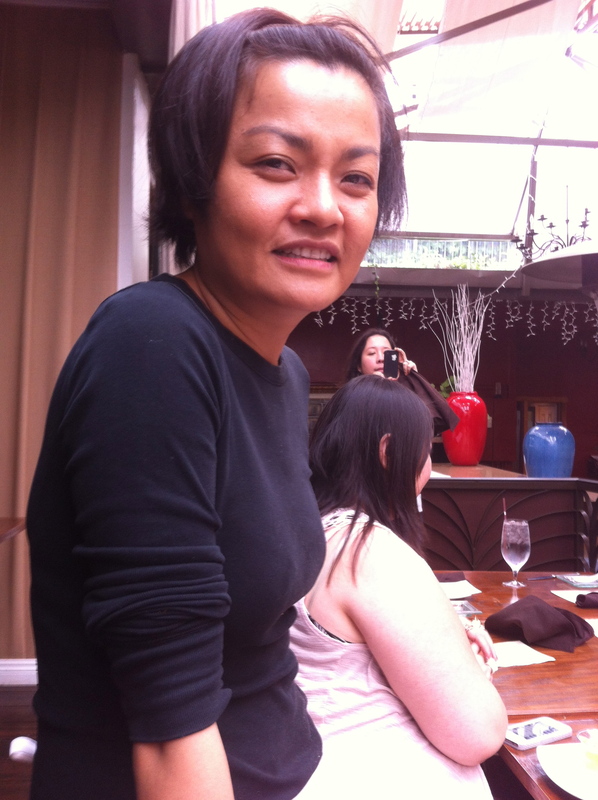 I met the talented Chef Connie Tran at Franco on Melrose. Looking into eventually opening a brick and mortar restaurant to reveal her Vietnamese family recipes, she worked out a deal to open BEP Vietnamese Kitchen every other Sunday for brunch. “I want people to experience Vietnamese food more than pho-noodle soup and rice paper rolls,” Tran said. Growing up in a large family in Northern Vietnam, Tran learned how to make Vietnamese dishes by watching and helping her mother cook. Later, in 1975, they moved to United States and eventually to Orange County, near Little Saigon. Her uncle opened a chain of restaurants called, Seafood Palace. Tran helped him cook wok-style dishes for his buffet-style Vietnamese cuisine. Later she teamed up with her mom to open Café D’Orient in the early 1990s. As a pan-East Asian style restaurant, Tran learned how to create dishes from Thailand, Philippines, Cambodia, Japan, Singapore and Vietnam. While showcasing homestyle breakfast and lunch dishes, the idea of BEP Vietnamese Kitchen came to her one day. BEP in Vietnamese means Kitchen. Before she makes her debut on April 21 at Franco, a group of food writers were invited to taste eight of her specialty dishes. We first received a bowl of peanuts in their shells. These peanuts were boiled for quite some time with cumin, paprika, garlic salt, and other spices. The outside was still fibrous, yet the peanut had a consistency of a baked or boiled potato. The spices make this a savory appetizer and paired nicely with iced sweet chrysanthemum mint tea. Next, we tried a bowl of rice porridge, called day phong. “This dish sets your stomach for the day and is easy to digest,” Tran said. She explained that in Vietnamese cooking, there must be harmony. A chef should balance salt, water, vegetables and sweet (dessert) with every meal. The porridge was topped with lardon crisps, poached egg, and lovely purple perilla (mint) with a splash of brown butter and crispy sage. It was hot, creamy and comforting. Next, a beautiful sliced star fruit salad arrived with fresh burrata, slivers of fennel topped on Bibb lettuce and a mild lemon balm vinaigrette. Before feasting on the protein dishes, we were encouraged to try a pickled plum soda. WOW, what a savory, sweet and salty combination. It’s made from imported pickled plums mixed with sugar and topped with bubbly soda water. Enticing plates of Spam sliders were delivered to us. 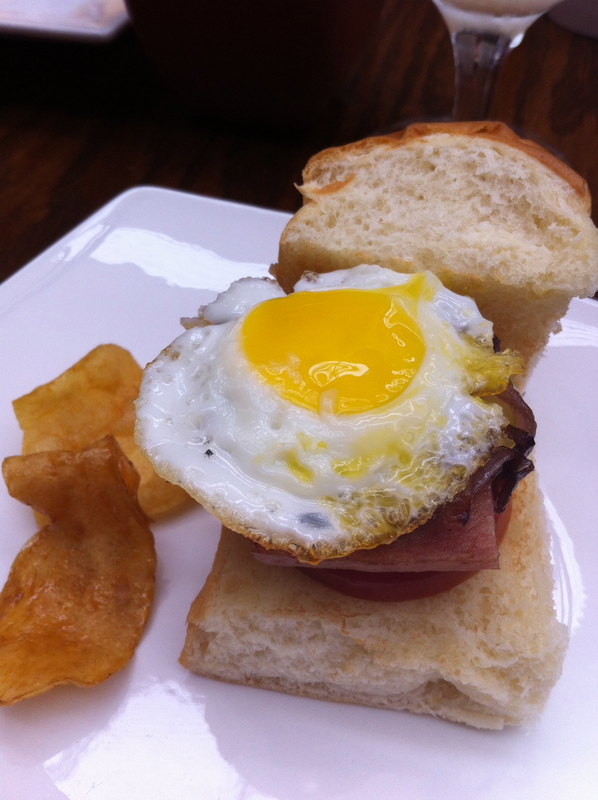 Inside the Hawaiian style bun was pickled cucumber, caramelized onions, tomato, Spam and a fried quail egg. It was served with sweet potato chips. I raved about the beef wrapped in betel leaf. The leaf is known to be high in antioxidants and is part of the pepper family. Tran wraps the betel leaf around beef and adds fresh coriander, ginger, scallions and shallots before grilling it. The beef arrives kabob-style and the leaf keeps it moist. It’s served with a plate of thin sheets of vermicelli, fresh herbs and a fish sauce called nuoc cham that arrives in a dish with lime juice, sugar, minced garlic and chili. We learned to take the thin white sheet, lay a beef wrapped in betel leaf on top, place some fresh herbs and nuoc cham and roll the vermicelli up like a cigar. The grilled turmeric catfish with fresh dill, scallions and roasted peanuts arrived on a plate with crunchy housemade sesame crackers. We took a piece of golden colored fish, placed it on a cracker, and topped it with some dill and scallions. It was exquisite. Both of these dishes are served family style. The next dish on the menu is the only Southern Vietnamese dish. In Northern Vietnam they don’t cook with coconut or palm sugar as a sweetener, however in South Vietnam they do. Connie’s braised galangal pork is sweetened with coconut molasses and served with a hard-boiled quail egg. Galangal resembles ginger, yet is more peppery in flavor. Connie puts large pieces of galangal with lemongrass to intensify the flavors of the pork. Her vegetarian Asian eggplant was cooked perfectly and surrounded by roasted corn and topped with Asian basil. 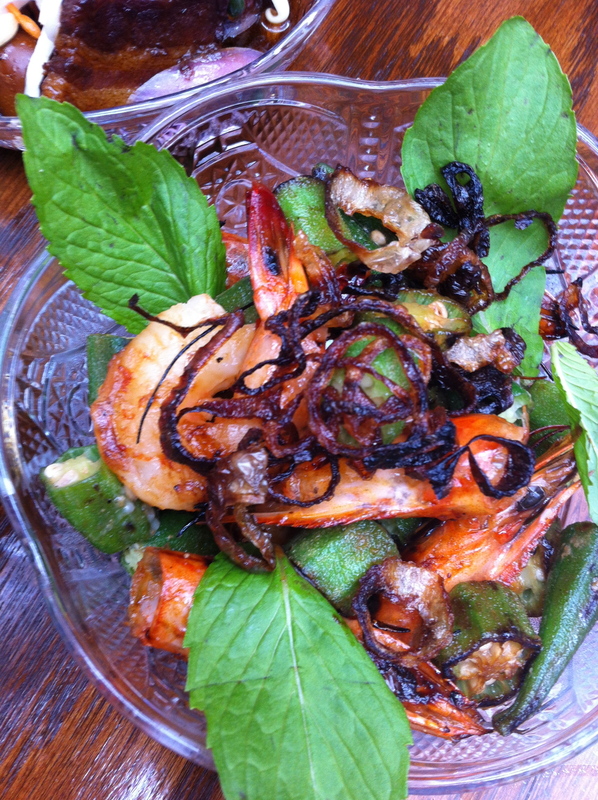 The grilled honey shrimp was served with caramelized shallots, northern spearmint, okra, and bird chili. Bird chili is red and small in size, yet packed with heat. All of these dishes were served with Jasmine rice. For dessert, we cooled down with kobocha pudding and a bright red rambutan. Kobacha is an Asian variety of winter squash. With a dollop of Vietnamese yogurt and crisp peanut brittle glass, it wasn’t too sweet and tasted a little bit like a creamy pumpkin pudding. Chef Connie Tran serves a multi-course “harmony” family-style on various Sundays. BEP is reservation only, no walk-ins, one seating at 11:30 a.m. To make reservations, email info@bepkitchen.com.